Impact Factor has come a long way since the initial first print & play edition of SQUAR3 and I am very proud and happy to finally have the professionally produced version of my second published game in my hands. You could head over to the Gamecrafter and order your copy right now, but I know that most people will not do that. Why? Because the price point for this game is pretty high. And because gamers are a cautios lot and will rather buy games from a well established designer/publisher than from a (very cool) online service like the Gamecrafter. 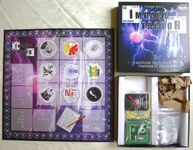 But let me tell you that there are a lot of really great games available on the Gamecrafter (including several kickstarted games) and I hope that Impact Factor is one of them. In order to give you as much information about the game as possible I will give you an overview of the components that come with the game and my thoughts about them. If you have read my components review for QuickDraft you know that I will not tell you that this is the greatest production quality in the world and that you have to buy this game. Instead I will give you an honest review, even if that means pointing out the (few) flaws I see. I know that this might not be the best marketing move but I think that whoever is willing to spend 60 bucks on a game should know what he is getting for his hard earned cash, ok? 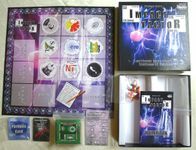 Impact Factor comes in a fairly large square box (for a game that started out as a 3 pages print&play) and it is beautiful. The box itself is a bit smaller than your Ticket to Ride box (I would definitely prefer a more standard sized box but this is the one the Gamecrafter offers and smaller than Ticket to Ride is certainly better than larger). The box is also much slimmer than your Ticket to Ride box and that is something I really like about it as it allows you to store more games on your shelf. The game comes with a nice shrink wrap (a new feature the Gamecrafter added to all games as a result of their Indigogo campaign) and it certainly looks and feels like a game you could pick up in your FLGS or on a convention. The cardboard used for the box could be thicker but I have seen worse. Browsing through my collection, the two game boxes it comes closed to are 1775 and Dungeon Twister. 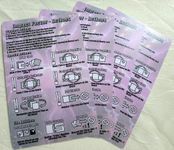 If the Gamecrafter offered an upgrade of the cardstock I would go for it (though this would further increase the price) but even as it is the box is very neat and will serve you very well. All in all I rate the box a 8.5 out of 10. When you open the box the first thing you will see is the gameboard, followed by all the other components - cards, tiles, tokens and - hidden underneath the cardboard insert - the rulebook. All the smaller components (cards, tiles, tokens) come inside plastic baggies so that you do not have to sort them before you start playing. If there is something I do not like completly it is the cardboard insert. It divides the box into two large compartments and their sizes are just right to hold the tiles and cards. But the cardboard used for the insert is pretty thin and mine was a bit bent from the shipping. It is nice to have that insert and I like it better than a plastic one (= more environmental friendly) but there will be those who toss it out because it is too flimsy for them. The box is also large enough to hold not only all the components but there is also room for an expansion or two - let's wait what the future brings . I rate the way all the components are included in the box and the insert a 9 out of 10. The board is the largest component of this game and it is an eyecatcher. There is nothing I do not like about it. It is large and very well produced. The back is covered with a black foil (as is standard for every high quality board) so that it will not warp or bend due to humidity. The print quality and the finish of the board are top notch as well. This game board could easily be in one of the Kosmos or Days of Wonder boxes and you would not complain about it. I will not write about the graphic design or the usability of the board as I am biased in this regard, but the pure quality of it is worth a 10 out of 10. The 26 tiles are the most important component of the game and they surprised me quite a bit. Yes, I had seen them on the computer screen before and new their dimensions but in reality they are so much bigger than I anticipated them to be. Those tiles are huge and hefty, which is nice as they contain a lot of information and their sizes makes it easy to read them even from across the table. 1. the tile thickness. 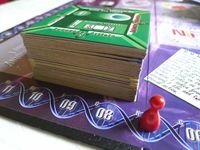 There is nothing wrong with it, but as Impact Factor is about stacking up tiles and knowing how many tiles are in each stack thicker tiles would be better than thinner ones. Tom Vasel talked about how he chose the thickest available option for his game Nothing Personal and I love the thick tiles in For the Crown and in The Road to Canterbury, but unfortunately the Gamecrafter does not offer different thickness options for their tiles (or cards) - at least not yet. 2. the back of the tiles is plain cardboard and this is the biggest criticism I have with the components. It would be so great to have the game logo printed on the back of the tiles, but this raw, brown cardboard is just not pleasing to the eye. It does not fit the visual style of the game and it does not look very professional. But again, I am limited to whatever the Gamecrafter offers and there is just no option for double sided tiles at this moment. All in all the tiles work and their front sides look great. They are large and hefty and handling them is fine, but their backs lend the game a less professional look, which is why I rate them with a 6.5 out of 10. 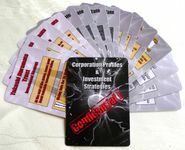 The game comes with several types of cards - poker sized cards for the corporation profiles (= player powers), large square cards for the portfolios and jumbo sized (and double sided) player aid cards. All those cards look and feel great. The cardstock used is not the thickest one available (I guess they round about 280 GSM - comparable to Munchkin and a bit thinner than Magic the Gathering). I complained about that cardstock in my review of QuickDraft as shuffling the cards is done often there. But for Impact Factor these cards are just right and I am totally happy with them. The last components in the box are 16 wooden pawns used as Investment and Score markers. I wanted to include pieces for each player that are not only different in color but also in shape, in order to make the game colorblind friendly. But the available options for wooden pieces on the gamecrafter were too limited for this (they do not have 4 different shaped but same sized wooden bits that would fit the theme of this game). Using those standard Halma pawns is the best option (I did not want to have plastic pieces and they are neutral enough to fit the theme of the game) but color blind gamers might want to exchange them for tokens of different shapes. The quality of the pawns itself is very good, but the lack of color friendliness leads to my rating of a 7 out of 10. 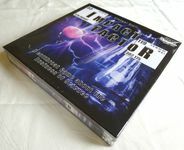 In contrast to the rulebook for QuickDraft the one for Impact Factor is great. It is pretty small (sized A5 round about) but it looks and feels very professional and I am totally happy with it. Yes, the paper could be thicker and glossy but I do not think that it would add anything useful to the game and if they offered such an option I am not sure I would use it. I will leave it to others to judge its content but the production quality of it is worth a 10 out of 10. All in all I am very happy with this version of the game and if those tiles would have a different back I would be really thrilled. The game looks and feels very good and it would not be out of place in your FLGS (or in your collection ). So, is it worth 60 USD? That is a tricky question. You can get some really great games from well known designers/publishers for this amount of money and most of them will give you more bang for your back. Why is that? Because of the economy of scale. With a print run of 5000 (or more) copies Impact Factor could sell for maybe 30 (or less) USD and at that price point it would be a steal. But as every single copy of the game is printed on demand and the game is completly manufactured in the US it has to sell for 60 USD (and neither I nor the Gamecrafter make hardly any profit with it). I think it is worth the money, but I might be biased in this. If you are unsure, check out the rulebook or get the print&play version (SQUAR3). And if you like it, give it a try as my final rating for the component quality is a 8.5 out of 10.